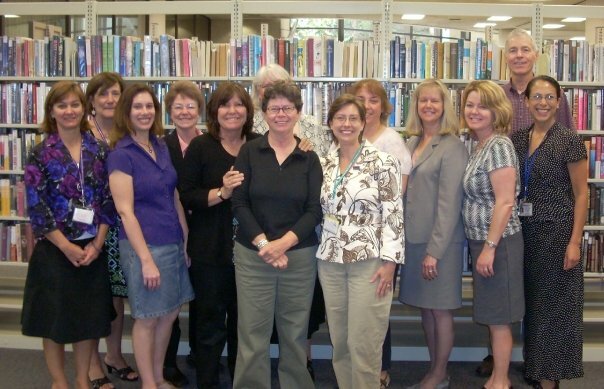 Jennifer Songster, Debi Vilander, Cyndi Effrain, Karol Seehaus, Nancy Paradise, Mary Hoffman hidden behind Sue Taylor, Natalie Beam, Silke Edwards, Chris Burcham , Jenny Vaughn, Cliff Phillips, Virginia Sanchez. It’s funny, even after almost 20 years (!!! ), it seems like I don’t have any interesting memories of any length! How can that be? I do remember my first children’s department program, which was a Summer Reading Club program the year the theme was Ancient Egypt. Never having worked with a large group of children before, I had no idea that they required so much attention! The program was a craft – making a mummy casing and decorating it with hieroglyphics. The preparation, getting the supplies and making the sample, wasn’t that big of a deal, but I think 40 or 50 kids showed up and we all went down to the auditorium lobby. Each of the kids had two pieces of butcher paper that we stapled together and then they decorated with markers. Once it was decorated they stuffed it with crumpled up newspaper. I think the entire children’s department staff was down there out of necessity; I don’t remember how the children’s reference desk was covered, but it must have been. Also, a film crew came, I think from Japan, to copy some Miss Universe photos and they wanted to shoot a short video of being handed a video tape from the Long Beach collection. For what purpose, I don’t know, but we went down to the Petroleum/Long Beach Collection Storage Room and they set up outside the door. I was supposed to come out and hand the tape to one of them and say something like “here it is.” We had to do a few takes, because the person in charge was underwhelmed with my acting abilities. He finally gave up and his disappointment in my performance was very clear! He didn’t actually say anything, but we both knew he was not going to use any of the footage! As a side note, considering today’s current events. In 2001 or 2002, Miss Universe was owned by Trump (is it still?) 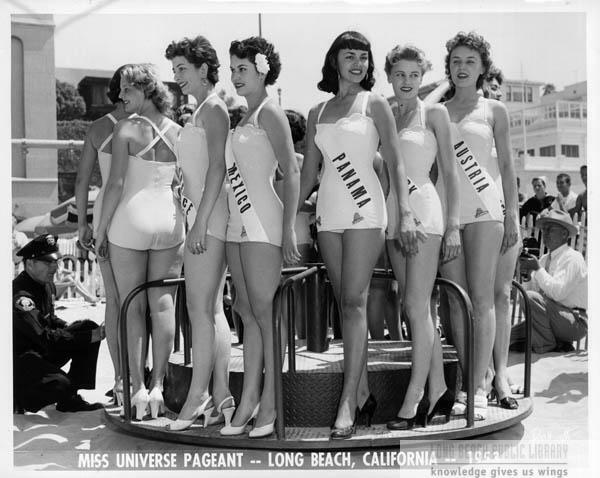 and they contacted the library for some historic photos of the pageant, but didn’t pay any use fees. A few weeks later, I happened to be looking at the Miss Universe website and there were the library’s photos! Of course, they may not have known they couldn’t actually use the photos they purchased, but I was (naively) amazed that a multi-million dollar corporation would be so sloppy (or unethical)….